Description Tags: Strong Role for a Leading Man • Strong Role for a Leading Woman • Musical Comedy • Revue • Social Themes • Something Different • Minimal Sets and Costumes • Contemporary. In a theatrical age of mammoth spectacles and brooding musical dramas, I LOVE YOU, YOU’RE PERFECT, NOW CHANGE is a rollicking throwback to a nearly extinct theatrical genre: the musical comedy revue. With book and lyrics by Joe DiPietro and music by Jimmy Roberts, I LOVE YOU... reinvigorates the revue by taking a hilarious and tuneful joyride through the dizzying spectrum of modern male-female relationships. In 1995, I LOVE YOU... premiered at New Jersey's American Stage Company, where, in the middle of one early performance, a woman in the audience couldn't help but blurt out, "This is my life!" From that moment on, the creators knew they were on to something. The following season, I LOVE YOU...moved to New Haven's Long Wharf Theater, and then on August 1st, 1996, I LOVE YOU... opened off-Broadway at The Westside Theater, where it was hailed as "Entirely winning! A show for real people about real people." (Gannett Newspapers). 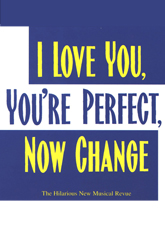 I LOVE YOU, YOU’RE PERFECT, NOW CHANGE has been playing for over 4,000 performances and 10 years since it opened in 1996 to become the second longest running show and longest running revue in Off-Broadway history. The musical has been showcased in more than 250 cities world-wide including London, Tel Aviv, Amsterdam, Sydney, Seoul, Rio de Janeiro and Johannesburg. In addition to its enormous success, the Off-Broadway production has been the site of 50 marriage proposals. Whenever I tell people I wrote a new play, the first question always is, “Well, what’s it about?”� With I LOVE YOU, YOU’RE PERFECT, NOW CHANGE, my answer is simple – “People trying to connect.”� During the initial productions of the piece, the creative team never lost sight of this dictum. As irreverent and satirical as much of the humor is, we always felt what made the show such success was the underlying sense of compassion we had for every character. “A Stud and a Babe”� is probably the broadest bit in the show, but at the core of the situation are two lonely people who desperately want to attract one another. The difference between playing these characters merely as two losers (and not as two people who happen to be losers) is the difference between a comic scene that's merely fun to watch and one that most of us can also relate to on some level. As a matter of fact, nothing in the play was written to be performed as straight satire – it's all intended to be played for the truth of the situation. If “Always a Bridesmaid,” for example, is performed as a send-up of country music, its effect is rather minimal. But if it’s sung as a woman’s lament that happens to be in the form of a country-western song, the truth (and humor) of the situation will emerge. Now don’t get me wrong. The play is first and foremost a musical comedy. Make it as funny as you possibly can. Just don’t forget to make it human too. I'm Jimmy Roberts, the composer of the music for I Love You, You're Perfect, Now Change—and how lucky we are, we chosen 300 or so, to be here, all of us, audience and actors—to be gathered in this former church, this house of worship—to experience this milestone together, as one body. And then there's the number 11. In the scene, A Stud and a Babe, as you all observed this afternoon, the “babe” in a desperate conversational gambit, offers up the unusual fact that her brother has 11 toes. Well, it turns out that a regional production of our show boasted a male understudy who…yes….actually had 11 toes—which he proudly displayed, upon request, to our director, Joel Bishoff! 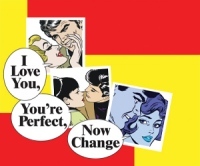 "I Love You, You're Perfect, Now Change" - in Chinese! *Promotional video rights can only be granted once a performance license for I Love You, You're Perfect, Now Change has been secured. Please contact customer service if you have any questions. If you have not yet applied for I Love You, You're Perfect, Now Change, you can do so here. LOG IN to learn more. *Archival video rights can only be granted once a performance license for I Love You, You're Perfect, Now Change has been secured. Please contact customer service if you have any questions. If you have not yet applied for I Love You, You're Perfect, Now Change, you can do so here. LOG IN to learn more.